Apologies for my absence. I was busy getting my weather on in hotter spots in the world. I said farewell in August of last year to T.S. Emily (and another Emily as well) and find myself writing again at an apropos time. Image below shows Tropical Storm Sandy (S. of Jamaica) intensifying rapidly and the latest Hurricane Hunter Recon flight reports a ragged eyewall forming. 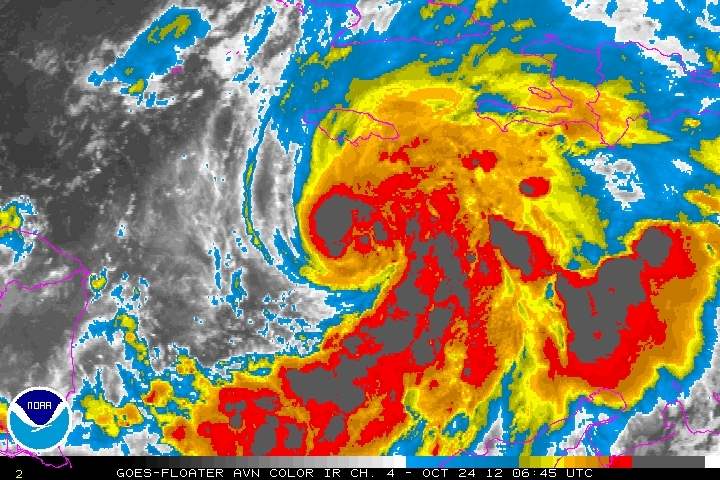 In short, expecting Hurricane Sandy to cause serious damage as it passes almost directly over Jamaica heading Northwards. It is possible - and will be quite interesting to watch for those afflicted with weather obsessions - that T.S. Sandy could impact a large portion of the East Coast this weekend and into Monday. Approx half of the world-wide computer models are forecasting an epic Nor'Easter by Sunday; I'm not biting on that yet. Regardless of the eventual track Sandy takes, the entire East Coast will feel the chill of fall by Monday. Frost likely during the early part of the week. North Carolina (read: Salisbury) should expect the first freeze of the season by the first week of November.